Wa Thiong’o public lecture - how inspirational! The Lion of African Literature Prof Ngũgĩ wa Thiong'o, who is considered the founding father of decolonialisation discourse graced not only our shores, but landed here at our offices! 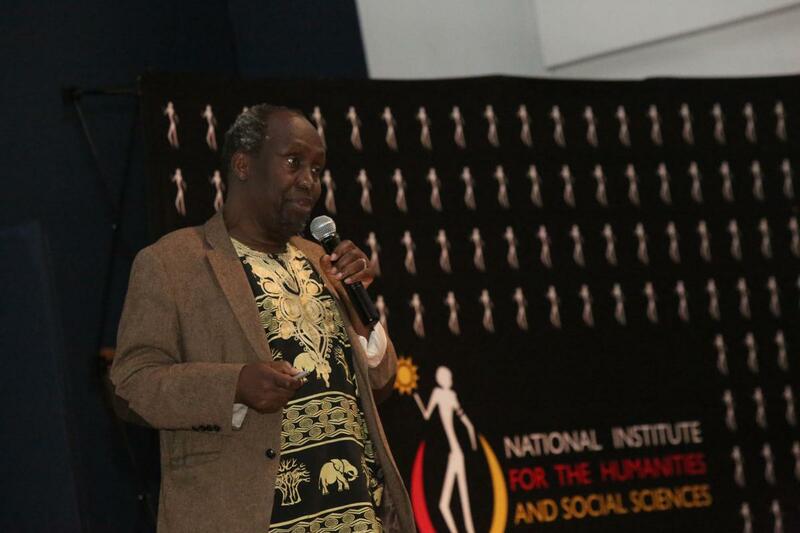 On 02 March 2017, Prof wa Thiong'o arrived in the country and the NIHSS team had the privilege of being the first group to meet and interact with the renowned humanities scholar. The PhD fellows also spent some time with the Professor, prior his Wits Lecture entitled "Secure the Base, Decolonise the Mind" at the Great Hall in the evening. The hall was packed to capacity and he was welcomed like a hero by the crowd when he took to the podium. On that day, Twitter was abuzz and the #NgugiPublicLecture @iNIHSS trended throughout the night. "Accents for access: ... While African leaders perfected their accents, Europeans sharpened tools for access to Africa's resources"
Use English... but don't let English use you..."
"If you know all the languages of the world but not your mother tongue, that is enslavement. Knowing your mother tongue and all other languages too is empowerment." "We must be careful with the vocabulary that defines us ... to not internalise the negativity." "Let us call people by what they call themselves." "...Black intellectual tradition has given so much to the rest of the world ... but this is often invisible". "In colonial conquest, language did to the mind what the sword did to the bodies of the colonised"
"It is not African languages that threaten English. But postcolonial African policy makers will often insist that they do." Prof Ngũgĩ wa Thiongo’s visit positioned the Institute’s brand to the world, with a number of followers on twitter also giving the Institute a resounding ‘thumbs up’!